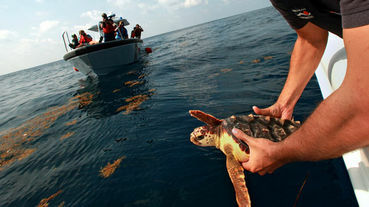 The release is a milestone in helping wildlife recover from the Deepwater Horizon oil spill. This is a tiny step. Let's protect these wonderful creatures from more oil. Hooray!! Thanks so much to everyone that made this possible for the poor turtles!!! I think this is the first positive news story I have read. I was so pleased to read it. I hope that the waters are safe to return to. I have heard that the long term impact of the Gulf Oil Spill is not yet known, and am concerned that the water may be damaged. Thanks for the good news though. Oh, what an uplifting article, about time, we have some good news from the disgusting BP oil spill. Thanks for sharing.